Say farewell to sniffy noses and hello to a new take on a classic: transform a Mason jar into a colorful pop-up tissue holder with JoAnn Moser’s Mason Jar Nation: The Jars that Changed America and 50 Clever Ways to Use Them Today. Much like room air fresheners, the needs of soldiers on the battlefield can be credited for the inception of disposable tissues. In 1914, cotton was in short supply. Paper product manufacturer Kimberly-Clark started producing Cellucotton as a substitute. First used as bandages in World War I, Cellucotton led to the creation of Kleenex. Around that time, a Chicago inventor came up with an idea that allowed for tissues to “pop up” from a box. Kimberly-Clark decided to package Kleenexes in the boxes and nose-blowing history was born. The magic in the pop-up box isn’t in the box itself; it’s in the way the tissues are folded inside the box that makes them magically pop up. Knowing this tidbit is the secret behind making a Jar Tissue Pop-Up. 1 Wash and dry the jar and then wipe it down with isopropyl alcohol. 2 Using the paint sponge, sponge the glass paint over the entire outside of the jar. 3 When the paint has cured, use an emery board to carefully sand off the paint from the jar’s embossing. 4 Open the box of tissues at one end. 5 Remove the tissues from the box, keeping them in one stack. 6 Free the corner of the tissue on the top of the pile, and gently feed approximately half of the pile into the top of the jar, short side of tissues down. 7 Screw on the jar’s band and you’re done. Learn how to make more than 50 Mason jar projects, including luminaries, planters, and upcycled art, in this eagerly anticipated book for DIYers! 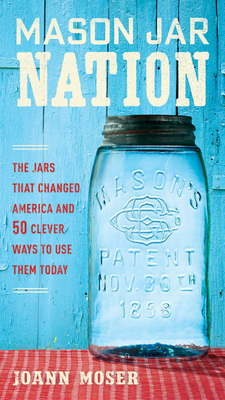 Mason Jar Nation begins by exploring the Mason jar’s impact on America since its 1858 patent. Prior to the jar’s invention, settlers had no reliable and safe way to store food for the winter, which required them to travel great lengths in difficult conditions and obtain expensive canned goods in order to survive. With its hermetically sealable two-piece lid and thick glass sides, the Mason jar changed the way mid-nineteenth century Americans fed their families. Although the popularity of the jars ebbed significantly from the 1950s until the turn of the century, interest in them has exploded in the past few years. Ball, the biggest brand name in Mason jars today, has seen its sales double since 2001. Younger generations, including Millenials, have adopted the iconic jars as emblems of a more sustainable time. The humble Mason jar has been “discovered” as a versatile and beautiful material for creating craft items such as chandeliers, luminaries, planters, containers, and upcycled art. The second half of Mason Jar Nation features over 50 of these adaptations, shown with clear photography, all designed and photographed by author JoAnn Moser, the “DIY Maven.” Readers who appreciate American cultural history, making fun and affordable crafts, and Mason jars themselves will love this new book and its tall, narrow shape that’s based on the proportions of the classic Mason jar. JoAnn Moser, writing as DIY Maven, is a featured contributor to Curbly.com, an on-trend DIY website that receives well in excess of one million visitors per month. Her designs and writing were featured in four books: Make It! Secondhand Chic, Make It! Hardware Store Decor, and Make It! Mid-century Modern, all published by Curbly Publications, as well as I Love Handicraft, published by China Light Industry Press.In addition to her not-so-secret crafting obsession, Moser is also an accomplished fiction writer and holds an MFA in Creative Writing from Hamline University, in St. Paul, Minnesota. Her short stories have appeared in Alfred Hitchcock’s Mystery Magazine and Futures Mystery Anthology Magazine, among others. She resides in Eden Prairie, Minnesota, where she and her husband design and build wood furnishings in their spare time. Her website is www.diymaven.com, and her Twitter handle is @DIY_Maven.